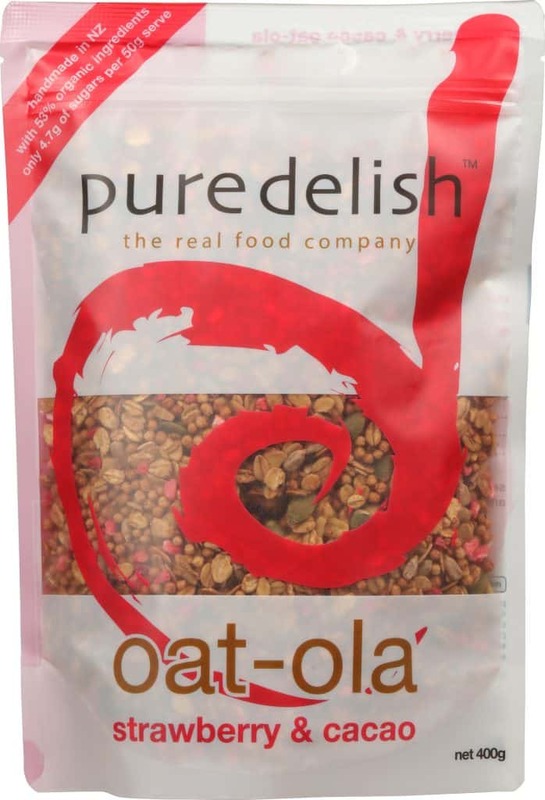 our strawberry & cacao oat-ola is a handmade granola made from nutritious organic oats, quinoa and seeds. lightly coated with cacao then roasted to perfection with coconut nectar to create a delightful oaty breakfast. with a splash of your favourite milk! as a topping for a fruit crumble or a dessert sprinkle! See our website for some more inspirational recipes and serving suggestions! ingredients: organic rolled oats (52%), seeds (sunflower seeds, pumpkin kernels, chia seeds), coconut nectar (coconut neera, calcium carbonate), quinoa puffs (8%), NZ cold pressed extra-virgin rapeseed oil, freeze dried strawberries (1.6%*), organic cacao powder (1%), sea salt. due to the natural ingredients in this product, very occasionally you may find an undetected nutshell fragment. once opened keep sealed and store in a cool dry place. we appreciate all feedback from our customers, please let us know what you think via our facebook page or email.